You need to collect 75 each of Yellow suns, water drops and strawberries. Getting matches on level 347 is not hard, but because there are so many bombs counting down you need lots of cascades to get the crops you need as the bombs don't count. You need to work at the bottom all the time unless you can see a line of five somewhere else on the board. Lines of five are possibly the only way to collect enough crops on level 347. Don't waste moves just trying to get rid of bombs, use cascades and lines of 5 to keep them under control. Start the level with some shovels and use one to get the crops into lines of 5 if you have to. 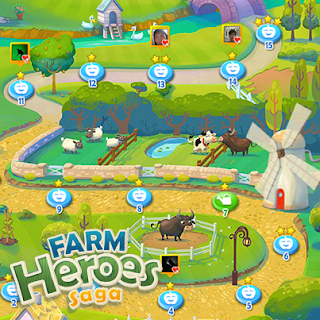 Below are some really good tips for Farm Heroes Saga. These tips will help you pass any level of Farm Heroes and are written by our expert player Beatrice. If the game has water, you may need to concentrate on making water and the board will get your crops...watch the bombs and see what removes them...there are a few levels that has a pattern of allowing a shovel to prepare a match and that is the only way I have found those levels to work..look for these sort of patterns.. This seems to be the question asked most " Why do I not get lives? ".. When you stop playing for the day/night, just ask about 3-4 times for lives and when you get on the next day, refresh/reload your games and collect all the beans..Only collect all if you have beans, otherwise if you need lives you won't have any..You have a white envelope that will hold your lives on the top row while you are playing. when you run out just click on envelope and take 5 more.. When you open your game and finish sending and collecting requests, before you hit the play button, you will see a shovel emblem, hit that and a board comes up inviting you to pay 250 beans and get 3 shovel boosters, if you are quick you can do that again and get 6 and then play..You can also open more games on different tabs being sure you have no shovels and get more and they all add up on the last board before you play..
Just open several tabs and open the game on each one, then go through each game buying shovels. When you get to the last game you will have lots. Using boosters is a matter of choice, I personally don't use them unless I see no other way of completing a level after trying many different ways. Boosters rejuvenate every 24 hours so if you feel you need to use them do. 5. Navigate to a lower level. Go to Farm Club and use the arrows to go back to about where you think the level is and run your mouse over the animal and it will tell you which level you collected it on..Find where you need to be, and I always open that game and then quit the game using the arrow in the upper left hand corner and then I go back and find the level I need in that area ..if you refresh, you will go back to your own game ending and have to do all this again. You can only use the dog once a day so you have to be careful about when to use it. Don't forget to keep the hen moving by matching next to her or hit her with a shovel, and if you have a lot of eggs gathering up, just go ahead and make them all be 1 as they are taking a lot of room up on the board.. Don't forget to crack the egg with a shovel if need be to get a chick or dragon late in game. Remember work those firecrackers when you have them on a game as they are a great helper..they will open flowers, move hens, take high point crops, stir the water and make it fly, and probably more. They have recently named him and that is what he does, he steals carrots and will mess up a move for you but also helps make a move when he hops over to the next carrot. If you make a match by him, he is stunned and that will give you 3 moves to gather more carrots..
Are aggravating and fun too, notice the color as that is what they will slurp up when you make them hop so plan carefully, but they help also.. Try using shovels to make some of your moves as the more regular moves you have left at the end of the game, the more stars you will have..
You are given the opportunity to spend some beans and get some help on scoring on Rancid..I have gotten at least one star using free and 1 star using the +2 so can't say how that really works either. 12. Making 5 in a line. This will gather all of one crop..For an across match you have to really watch the board and look two rows up for the crop you need then you can take a shovel and maneuver a crop into place and then take a shovel and let the match drop in order to avoid losing the points on the other crops ..
To guide the bull up...match above...down..match down...across..you need a vertical match or on the same row...if you will just use one game as a practice game, you will see how this works, and it was helpful to me on some levels to watch a video and only concentrate on the pattern as everyone's crops will be different but poppies in same place. 14. Water and water pots/buckets.. Matching next to the pot gets the water to boiling/brimming and another match will get the water to flying but did you know that you can let 3 or 4 pots get brimming and then hit with a shovel and water scatters and makes matches.. Some games the more water you make the better..
White Sheep. they will land on the spot the move is made...Some levels you need to make the hay by matching a seed with water, and by watching board carefully, it is possible to get as many as 3 jumping at once...Black Sheep..when they are mixed together on the board , so far, the white sheep jump over the black sheep which is good as the black sheep eat the hay...and black sheep alone just eat hay. Matching twice by each one but in order for them to fly away, they all need to be lit up so if necessary , hit them with a shovel. Watch the helper points and it gets to where you just need a few points for him to help you again, and you have a shovel, just pluck the points out of a place you can't make a move and it won't mess up a move..Remember a 1 is actually a 2 and and 3 is a 4 and so on, and it will help you get your crops..